I Love You, Man stars Paul Rudd as Peter Klaven, a real-estate agent who has just asked his girlfriend Zooey (Rashida Jones from The Office) to marry him. After overhearing an awkward conversation of Zooey and all her girlfriends about him, Peter realizes he doesn’t have any guy friends to be his Best Man for his wedding. To rectify that situation, he asks the help of his gay brother Robbie (Andy Samberg from Saturday Night Live) who helps him arrange man-dates to find that new best friend. They all fail miserably though and Peter is about to give up, when he meets Sydney (Jason Segel from Forgetting Sarah Marshall and How I Met Your Mother) at an open house. Even though Judd Apatow had nothing to do with I Love You, Man, I’m guessing people will compare it to Apatow’s previous movies, like Forgetting Sarah Marshall and Knocked Up. It does fit in that range of comedies though and it’s not that hard to see why people place those movies in the same group: they star the same set of familiar faces (Rudd and Segal) and feature a refreshingly new premise. In this case, that premise of the film is the “bromance” between Peter and Sydney and how difficult it can be as an adult to find new friends. It has all the trappings of a regular romantic comedy (they meet, they go on a first date, there’s a montage of all the fun things they do together, they have a fight and break-up, then get together again) without the actual romance part. And it works. 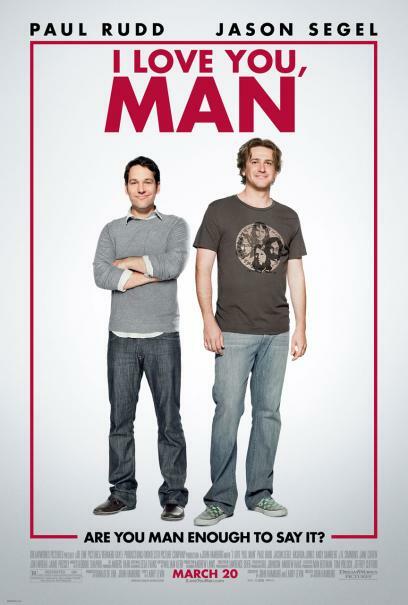 Paul Rudd and Jason Segel both turn in a great performance and their bromantic chemistry on screen is believable. Rudd’s character is charming as the perfect boyfriend, who always put more time into his girlfriends than into his friends. He knows what to do and how to act around woman. But now that he has to find a best friend, you realize how awkward and hopeless he is around men; he has no idea how to connect on a guy-to-guy level. Sydney, on the other hand, is the complete opposite: he’s macho, self-confident and has always had guy friends. Together, these two characters form a great on-screen duo, supplying us with some hilarious situations. Besides the two main characters, there is a great supporting cast. Rashida Jones is adorable as Zooey; her character stays calm and collected through out most of the movie, and it gives us a nice break from some of the whiny “wife”/”girlfriend” characters there are out there. Andy Samberg is brilliant as Peter’s gay brother, although I wished they had given him more screen time. I loved the characters of Jon Favreau (Barry, the always grumpy husband of Zooey’s best friend) and Thomas Lennon (Doug, the gay man-date that Peter goes on); they both added some great scenes. My only peeve with this movie were with some of the jokes/scenes. Now I get that this is a comedy and not every joke will be to everyone’s liking, but I didn’t laugh as much as I expected (let’s put it this way: I laughed more at the screening of 17 Again with Zac Efron). Early in the movie there’s a projectile vomiting scene (no, I’m not kidding here), which was just way too gross, and went on too long (the scene, not the vomiting). There were more scenes where you “got” what the joke was, but nobody in the cinema was laughing. Maybe it’s just not my type of humour, but I was disappointed that it wasn’t as funny as it could have been. This review was cross-posted on Screenjabber.com.